A visit to the library, whether it be the physical building or its online location can have a massive impact on the lives of individuals and communities. If you don’t believe me then have a look at The Bradford District Care Trust and Libraries Partnership Project which has just been awarded the CILIP / LiS Libraries Change Lives Award for 2008. Since 2006 Bradford Central Library has provided excellent opportunities for people with a range of learning disabilities to realise their full potential and become active citizens within their local community. Check out the real world impact of the project in a recent article from The Guardian. Congratulations Bradford; breaking down barriers and promoting access, it’s what the library’s all about! That’s what John Dolan demanded to know during his speech at today’s Library and Information Show in Birmingham. He blamed “fearful and restrictive thinking locked inside IT offices” for the delay in delivering adequate digital services to public library users and called for “training and development” to better equip library staff to meet the demands of 21st century users. After all, I know for a fact that anyone graduating from the University of Strathclyde’s Information and Library Studies course over the last few years are more than capable of managing and creating access to online and digital resources; not to mention communicating the concept of Web 2.0 and helping users to interact with its associated tools! Large corporations go where the money is, they always have. And they’ve become increasingly aware of the potential of Web 2.0 in delivering enhanced revenue streams and cost effective communications with shareholders, customers, staff etc. Enterprise 2.0 is the latest buzz word in the business world and involves commercial organisations driving business via blogs, mashups, podcasting, RSS, social networks, widgets and wikis. It’s been predicted that businesses will invest almost $5 billion on web 2.0 tools over the next five years. 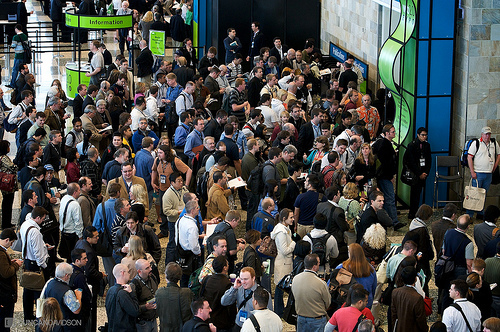 A four day conference takes place in San Francisco this week with thousands of Web 2.0 entrepreneurs meeting up to discuss what they can spend their money on! What’s the point of a search engine if we can’t figure out how to use it? Couple of articles today (in The Guardian and The Bookseller) discussed how students and researchers are settling for mediocrity from commercial search engines that offer user friendly interfaces and convenience over quality and depth. Fewer of us seem to be exploiting the many benefits of academic search engines such as Archives Hub, Edina, Intute and Copac. It’s a shame really because these resources provide unparalleled access to the best in academic research. Unfortunately they fail at the point of entry for many of today’s users who expect to retrieve exactly what they’re looking for in a matter of seconds, not minutes. They’ve been brought up on a diet of Google, Amazon and ChaCha and demand a fully interactive service that is intuitive and sensitive to their needs. I don’t think there’s anything wrong with that…and if the academic search engines can successfully emulate the positive aspects of commercial models then everyone’s a winner!